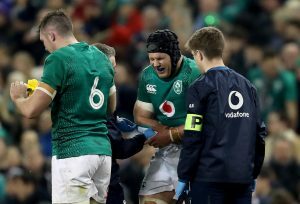 THERE were probably a couple of hundred moments of contact during the clash between Ireland and Argentina just like the one that led to Sean O’Brien sustaining another desperately unlucky injury. It was so unremarkable that even the replay couldn’t shed much light on the collision which has left his season hanging in the balance once again. This was, lest we forget, his first international since the clash with South Africa last November. Since then he’s had a short but effective return with Leinster and now this. How hard must it be to take yet another injury setback and not even a full half of international rugby played. And in those 38 minutes he had built up a fair head of steam. His first carry was after just 15 seconds and he was his usual abrasive self for the rest of his time on the pitch. The only positive to take is that O’Brien has shown himself to have an incredible attitude when it comes to injury recovery. So many times over the course of the past four or five years, he has been hit with setbacks which have put him out for months on end. Each time he works diligently and gets back to full fitness; always confident that when he gets back on the field he will make a big impact. It’s that confidence in his powers of recovery which has taken him so far. It will take a few days, of course. But you know he’ll take his medicine, look at the calendar and plot a return. It’s what he does. Indeed, it was being reported as early as Sunday that he has his sights set on getting back into a green jersey some time during the upcoming Six Nations. You can’t keep a good man down. As for the game, O’Brien’s loss was Dan Leavy’s gain. The Leinster backrow had hardly returned from South Africa where the province were away to take on the Southern Kings last week but the air miles didn’t impact negatively. He was one of the main reasons Ireland got back on track to win the game and he’ll be first in line for the New Zealand game on Saturday evening. It was a pretty forgetful game for Ireland. So many players were below par. Johnny Sexton hasn’t kicked as poorly in a game in years, there was little continuity and the set pieces misfired. If they needed a result to concentrate minds for the week ahead, then they certainly got it. We’ve heard much over the years about Joe Schmidt’s ruthless honesty in post-game review sessions. He has plenty of ammunition for this one. And yet, for all that, they still won the game. New Zealand next week will be the perfect gauge to test where Ireland are a year out from the World Cup. After their own near-miss against England at Twickenham they will be determined to lay down a marker against the reigning Grand Slam champions. That’s pretty much the whole point of their trip to the northern hemisphere this November. They will have a few points of focus for the coming week like the Irish lineout, the inconsistency of Sexton when in possession and the inexperience of Jordan Larmour, assuming Rob Kearney struggles to make his comeback in time. There was so much hype surrounding Larmour after the Italy cake walk that it was always likely there was going to be something of a comedown about his game on Saturday. He fluffed his lines under a couple of high balls but it was the lack of opportunity for his jinking feet that left Irish supporters disappointed. He has been compared to many greats since he burst onto the scene at senior level last year but one name that comes up time and time again is Christian Cullen. It would be great if he could find some space to jink through a couple of holes against Cullen’s homeland at the Aviva this coming weekend. Imagine what a win for Ireland would do for the team’s mindset. It would bring them through to the Spring on the crest of a wave and from there it’s only a short hop to Japan next autumn. Wouldn’t it be great to turn the All-Blacks over on home soil?